According to this old In Living Color sketch, Castle Searcy may very well be Jamaican. She has been involved in a whole slew of arts, cultural, and commerce activities here in Denver, and she just keeps going. Castle is the ultimate gal about town, affiliated with Tootsies the Nail Shoppe; Rebelle by Tootsies salon; Mellow Mushroom Colorado; Wingbandits; Castle’s Corner at Megafauna; the wildly successful Denver Startup Week; Denver Art Museum’s CultureHaus; Denver Film Society’s Reel Social Club; a documentary on Scotty the Blue Bunny; the Starz Denver Film Festival; and most recently, the Art of Winter. And speaking of the Art of Winter, have you been able to participate yet? While the opening festivities kicked off this past weekend, more parties, panels and events are still running through Friday, February 7th. Some of the remaining highlights include: RAD: 80’s Ski Party [free party with drink specials, 80s jams, snow cones, and prizes]; Tip & Tinker [design-your-own LED beanie, local brews/wine]; Dumb and Dumber 20th Anniversary Screening & Party [Dumb and Dumber on the big screen, drink specials, and themed after-party]; and of course the Art of Winter Closing Party, which will be held in conjunction with the Santa Fe Art District’s First Friday event. So there is still time to celebrate our unique wintertime culture here in Colorado! 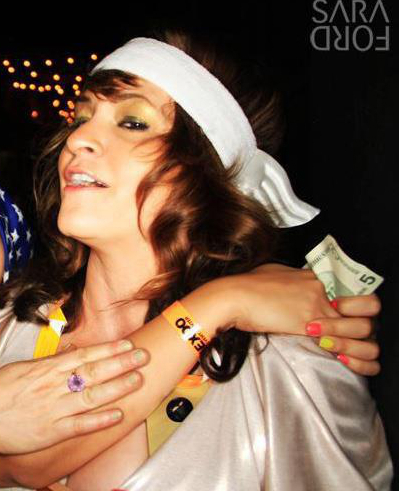 And more fun facts about Castle: She is obsessed with Seinfeld, throws an epic Festivus party every December, has the perfect costume for any theme party, rocks a gold tooth, and can be five places at once. So…with this much cred, what does Castle think is good in D-Town? Well, read the list below and find out silly, xoxo. A little about yourself: Grew up between Georgetown, CO and Vaughan, MS. High school, college and grad school in Denver. Been back in town 4 years now after 11 years in San Francisco. I love to make things look pretty, and I love to have fun. What’s missing in Denver? A W Hotel, Barney’s, multiple Trader Joe’s (I know it’s coming, but it’s going to be too crowded), Marc by Marc Jacobs, Beautifull, a good place to work on your laptop late night, and men who wear cologne. A friend has three hours to kill in D-Town, what should they do? Go to Casa Bonita, stop by Forest Room 5, and then drive around past the following attractions: Little Man Ice Cream, Union Station, Brown Palace, Denver Public Library, Denver Art Museum, and ending at Megafauna for a local Denver souvenir. Anything you want to plug? Art of Winter!